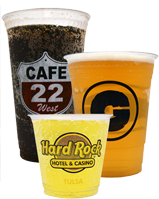 Does your business need custom printed cups, or printed cups with your company logo on them to increase your branding? 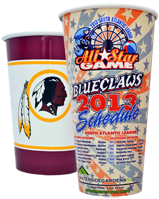 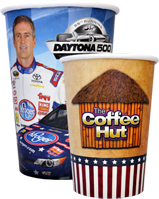 Our custom cups, also known as personalized cups, are sure to impress in both quality of product, and print capabilities. 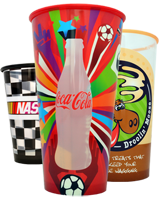 These marketing masterpieces are an opportunity to gain the most IMPRESSIONS possible both in-store and beyond. 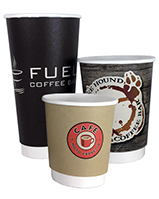 We offer disposable cups, as well as reusable cup options. 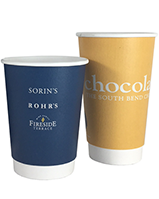 Our Clear Plastic PETE Cups have a 5,000 cup minimum order requirement and a 4 color spot PMS print capability, while our Cold Paper Cups, Hot Paper Cups, Clear Plastic Cups, and White Plastic Cups have full coverage and 4-color process print capabilities. 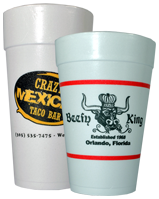 The only limitations to these custom plastic cups is your imagination! 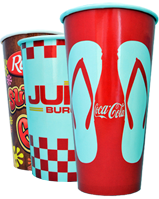 Give us a call today for a step by step walk-thru of applying your print artwork onto your very own small to large order of personalized plastic cups.